For fans of crossword puzzles, there is no dearth of options on the App Store. 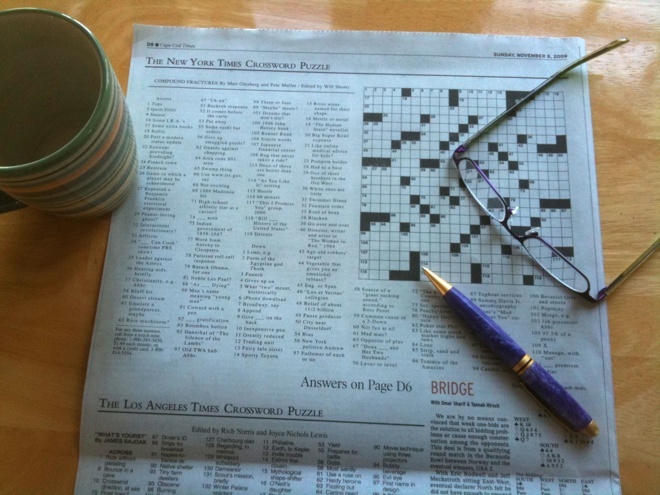 In a category fit to bursting with contenders, Crossword: Arrow Words stands out for its choice of crosswords, which should appeal to an international English-speaking audience, and its pleasing and simple interface. To start with, Arrow Words gives you the option to choose between easy, normal, difficult and very difficult crosswords, with the easier ones having lesser squares and requiring a smaller vocabulary in comparison to the more difficult ones. Each difficulty level has 100 puzzles for you to work your way through, giving you 400 of them in all. At the start of each crossword, you can see how far you’ve progressed in your chosen difficulty setting, your current progress and play time within the puzzle and your best time within that difficulty setting. All the difficulty levels are available for you to try your hand with, so you don’t have to play through the easier levels in order to get to the more challenging ones. You cannot, however, go back to a puzzle that you have already solved once. You can choose three display types for the puzzles—classic, news and colour. They are all well-designed and use large squares and clear arrow-marked instructions to help you figure out which clues correspond to which squares. The clues themselves are displayed inline, instead of as a separate list, which makes the puzzles more readable and faster to solve. The keyboard also displays the clue that you are currently working on and a button on the lower-left corner lets you switch between horizontal and vertical words. You also get a Help button on the keyboard that allows you to have the game auto-fill a letter or a word that you are stuck on. Unfortunately, however, there seems to be no time penalty for using that aid, which leaves very little incentive for you to not quickly call on it when you are in a jam. You’ll have to discipline yourself to only use it when you can see no way out. The Help button also includes an option to point out any errors on the board, so you can figure out why a seemingly completed puzzle won’t let you advance to the next one. What we thought was the best feature of this game was the puzzles themselves. Unlike in most other crossword apps on the App Store, the puzzles in Arrow Words use generic clues that any English-speaking person will be able to enjoy solving. By contrast, pretty much every other crossword puzzle app we have ever used tends to have a lot of references to region-specific pop culture and other trivia, making parts of it incomprehensible to an international audience. If there’s one thing missing from Arrow Words though, it’s integration with Game Center. As much fun as it is to compare your puzzle-solving skills against your own past performances, it would have been more fun yet to pit yourself against your friends and rack up achievements for doing a good job. Hopefully, we’ll see these additions in a future update. Overall, we found Crossword: Arrow Words to be a well-made game that should be a solid addition to the iPhone or iPad of fans of crossword puzzles everywhere. Its interface is unobtrusive and gets out of your way and the subtle sound effects it uses make the task of entering text and working through a puzzle enjoyable. It is up there with the very best crossword puzzle apps on the App Store. Read next: What’s cooler than a Super Mario-themed wedding invitation? Not much.